Did Prabhupāda know things that the Six Goswami’s Did Not? When discussing certain topics – like the answer to the essential question, “Where do I come from?” – I have a few times heard senior disciples of Śrīla Prabhupāda suggest that Prabhupāda told us things that are different from what Śrī Jīva Goswāmī told us. If asked how Prabhupāda could teach something different from what he was taught, they explain that he could do so because Krishna directly gave him this new information. If asked which version we should accept and adopt, they explain that it is our duty as followers of Śrīla Prabhupāda to accept only his opinion, and reject the opinion of the previous ācārya. I can accept that Prabhupāda may have known more than his gurus, or better understood how to explain certain things to the people he was teaching, because this is not unprecedented and doesn’t go against the fundamental principle of guru paramparā. (For example: Śuka is glorified as being even more capable of fully revealing the Śrīmad Bhāgavatam than his father and guru, Vyāsa.) However that’s not exactly what is being suggested in the above scenario. What is being suggested there is that Prabhupāda can contradict his gurus’ conclusions – because Krishna told him to. I disagree. First of all, it goes against everything I learned from Prabhupāda about guru paramparā. Secondly, it definitely seems unrealistic that Prabhupāda received fundamental information from Krishna that contradicts what his own guru received from Krishna, what Śrīla Bhaktivinoda received from Krishna, and especially what the founders of Gauḍīya Siddhānta – Śrī Rūpa, Sanātana, and Jīva Goswāmīs – received from Krishna. Did Krishna change his mind about reality recently? (a) conclude that Prabhupāda doesn’t purely represent his guru-paramparā. (b) conclude that I misunderstood Prabhupāda. (c) conclude that I misunderstand Prabhupāda’s gurus. Everyone of us who have been introduced to Krishna as a result of Śrīla Prabhupāda’s compassion and love, will surely want to explore every option before considering option a. Option c may seem the most likely option, and often may be. It may be hard to understand Prabhupāda’s gurus because most of what they wrote was not written in English, for example. But, if we penetrate the language barrier by learning Sanskrit and/or Bengali, or taking recourse to someone who has, we find the words of ācāryas previous to Prabhupāda to be patently clear because their only surviving words are preserved in textbooks deliberately written to be concise, definitive, and self-contained. Additionally, there are many gurus previous to Prabhupāda, so we can look for confluence to confirm our understanding of any single one of them. If we have, say, five important ācāryas all saying the same thing on a topic, it is in fact very difficult to misunderstand the topic. Such is the case in the issue of the question, “Where do I come from?” This makes option b the most likely possibility – we misunderstand Prabhupāda. Although Prabhupāda wrote in English and comes from a relatively contemporary background, it is really not very hard to misunderstand him because so many people base so much of their understanding of his message on things he is merely reputed to have said once or twice to someone, or that he is recorded to have said in his hundreds of recorded lectures, conversations, and letters – which are very contextually sensitive words relevant to very specific individuals, at very specific times, in very specific circumstances. Then, why do many devotees refuse to choose option b? Some even refuse to choose b or c and inadvertently choose “a” by claiming that Krishna delivered a new version of siddhānta to Śrīla Prabhupāda. By choosing option a, unknowingly or not, we paint an absolutely unacceptable picture of Prabhupāda as someone who does not represent his own gurus on fundamental principles. This causes such a problem for everyone. There are infinite possible ways to illustrate, explain, clarify, and apply a tattva, but there are never multiple, contradictory versions of a tattva. If we think there are two versions of tattva to choose from, we are wrong. In guru pamaparā there are never “two opinions” on any fundamental subject. There is one opinion, with infinite ways of expressing, explaining and applying that opinion. If someone has an opinion different from the opinion of Bhāgavata Purāṇa as explained by Śrī Jīva, that person is simply not a representative of Śrī Jīva’s Gauḍīya Vaiṣṇava school. Maybe their opinion is brilliant, maybe its ridiculous, that’s unsure. What is sure is that, if it differs from the opinion of the Six Goswāmīs it is not a gauḍīya vaiṣṇava opinion. There are infinite possible ways to represent, illustrate, explain, clarify, and apply a siddhānta (a philosophical conclusion), but there cannot be two contradictory siddhāntas in the same school. If we think there are two to choose from, we are wrong. Previous No Difference Between “Krishna” and Krishna? I recently read all of Prabhupada’s published letters, and it seems to me that he was confronted with a dilemma. The Americans he found were different from what he expected to encounter, so he had to insist upon certain conventions that didn’t seem to exist before. Beards, or the lack thereof, are one example. It’s funny to me that ISKCON publishes photographs and drawings of the previous Acaryas wearing beards, but we are instructed to be clean-shaven. I realize that it’s so small a point as to ve virtually insignificant, but it also illustrates that some of Prabhupada’s instructions arose from circumstance rather than being eternal teachings. I suppose it is up to one’s spiritual master to help him or her navagate this course. Thank you for the reply. I understand your point and do not dispute it. I was trying to say that I have not seen where Prabhupada taught that. 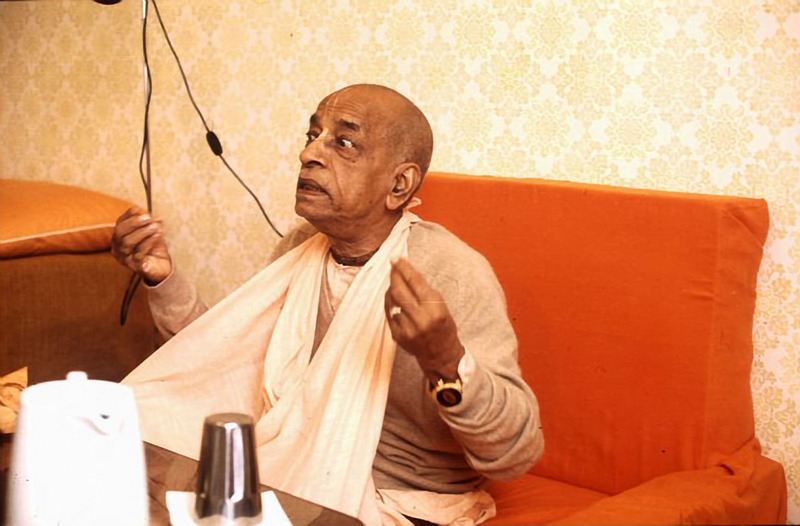 There seems to be a tendency among some followers of Prabhupada that he is special, so special that anything that come out of his mouth is to be taken as the siddhanta whether it agrees with 500 years of theology and philosophy or not. This is unfortunate. Yes, he WAS special–traveling the world multiple times, instilling sraddha in thousands of people, writing many volumes of books–isn’t that special enough? It comes down to a misunderstanding of guru-tattva: if we think every word the guru says is absolute truth and not subject to rational scrutiny then we are bound sooner or later to end up with some mistaken notions about the teachings. A much better, more rational approach is to see if the guru is in concert with the greats of the tradition and if not figure out why. Option A is untenable for obvious reasons.